Mix the buckwheat dough, roll it, layer it, slice it. It looks so easy - providing you have the right knife. Although soba (buckwheat noodles) isn't often made fresh in most homes these days, when you do get the chance to eat it, it's the most delicious of all noodles. Trust us - we've eaten a lot of noodles. The New Year is classic soba-eating season, but zaru soba, on a bed of ice, keeps you cool in the heat of summer. 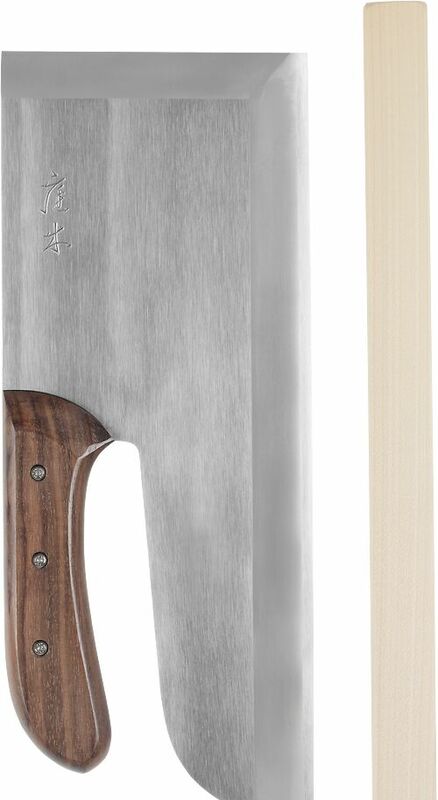 This knife, with its long, heavy blade of Shirogami steel, cuts the soft dough into symmetrical noodles with a lovely, repetitive action. Comes with a Magnolia blade protector and a heavy canvas wrap cover, in a lovely, and very Japanese, box. Niwaki Tip: Do be careful with the washing up.